NeoscreenTM from Immunitrack is a leading platform technology for study of Major Histocompatibility Complex class I and class II (MHCI&II) interaction with epitopes of interest. By combining both affinity and stability assessment of MHC-epitope binding, the NeoScreen™ platform reduces inaccuracies and false positives that can be seen when using affinity-only approaches. By leveraging Immunitrack’s unique capabilities in MHC II manufacture, NeoScreen™ opens up the possibility for immunogenicity screening using MHC II. Up to 80% of relevant neo-epitopes from cancer may be presented by MHC II. Vaccines: Development of new potent vaccines. Immuno-oncology: Neo-epitope selection for personalized cancer vaccine, screening for new cancer specific epitopes. Biologics: develop biologics that are tolerized by cohorts of patients. Biomarker: customized MHC-epitope complexes to monitor specific T cell populations in patients or mice. Computational, predictive methods to identify MHC binding peptides exist. However, they tend to be imprecise and over-predictive, i.e. identify a substantial proportion of false positives. Immunitrack offers state of the art peptide MHC affinity measurements by very sensitive assays. The assays use nanomolar concentrations of MHC I and measure the direct binding of peptide to MHC . The assays have been validated in several NIH funded projects and peer reviewed articles, accounting for more than 100.000 Kd measurements in the Immune Epitope Database (IEDB). Peptide-MHC stability is a better indicator of immunogenicity than affinity (Eur J Immunol. 2012 Jun;42(6):1405-16). Our stability assay measures the decay of MHC I complexes at physiological temperature enabling precise half-life determinations. All assays are amendable for HTS screening and do not require any modifications of peptide. Affinity measurements of 4 tumor antigen peptides, MART-1 WT (Kd~23nM) binds nearly 10 times weaker than the A27L mutant (Kd~2 nM). Stability assessment of the two MART-1 variants shows an increased stability of the A27L variant compared to WT (Half-lives: 8 and 2 Hrs respectively). For MHC I it has been shown that stability is a better indicator of immunogenicity than affinity. In-house data from Immunitrack supports this hypothesis for MHC II. Our stability assay measures the decay of MHC II complexes at physiological temperature enabling precise half-life determinations. All assays are amendable for high-throughput screening (HTS) and do not require any modifications of peptide. Figure shows two EBV derived peptides of nearly equal affinity (Kd of 1 and 6 nM). 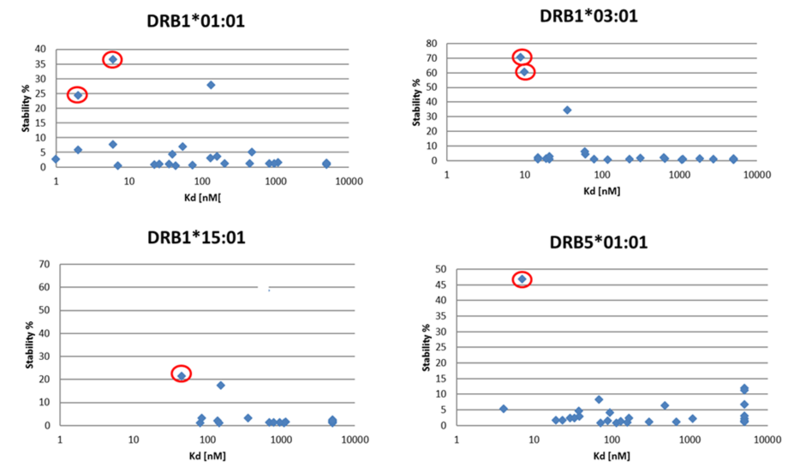 Though both peptides show strong affinity to DRB1*15:01 only the known T cell epitope (orange) have a high stability or long half-life, underlining the importance of stability analysis. NeoScreen™ Stability vs. Affinity data. Peptides with a Kd lower than ~100 nM are normally considered potential T Cell epitopes. This figure underlines the fact that affinity not necessarily correlates with stability and that stability assessment is a better measure for peptide immunogenicity. x axis: Kd measurements of CMV derived peptides, y axis: stability measurements on same peptides, 100% reference peptide is not shown. Red circles represents “true” CD4 T cell epitopes identified by Elispot and MHC II tetramer analysis (PLoS One. 2014; 9(4)). Immunitrack’s mission is to provide the research community with tools to select or redesign drug candidates at the early stage of R&D but also to provide reagents to monitor lead drug candidates effect on patient’s immune system.